Description: Unpack the Lord’s Prayer, which is so often taken for granted. Reveal the life-changing impact that every line of this prayer can have. This easy-to-follow presentation includes lots of discussion questions for interesting interaction. 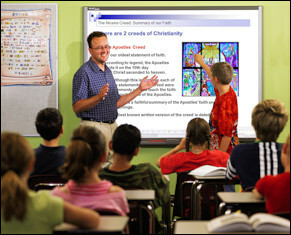 Created for the RCIA Period of Purification and Enlightenment, it’s also good for children’s and adults’ Religious Education classes. Comes with a Catechist Guide and a 1-page hand-out for the class: “Meet Our Father in the Lord’s Prayer“. This is included in “The Our Father Prayer” PPT package above. Add to the order only if you want copies for other uses in the parish or do not want the PPT. 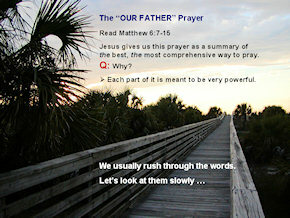 The “Our Father” Prayer: Do I really mean what I pray? Add this hand-out to inspire a good examination of conscience for the candidate’s preparation for first confession (not included in bundled discount package).